Black drum are gray or black colored with a high arched back. They get their common name from a large and elaborate swim bladder that, by using special muscles, can resonate to produce croaking or drumming sounds. These fish have 10-14 sensory chin barbels that they use to detect bottom-dwelling prey. They can crush these items by using their cobblestone-like teeth, or pharyngeal tooth plates. Black drum occur along the coasts of the Gulf of Mexico and the western Atlantic Ocean. The Atlantic portion of the stock most commonly ranges from the Chesapeake Bay south to Florida. Black drum is the largest member of the drum family, Sciaenidae. Maximum adult size is 5½ feet long with a weight of 146 pounds. Black drum in the Chesapeake Bay region spawn at the mouth of the Bay and seaside inlets of the Eastern Shore usually between April and early-June. Mature fish may contain over 30 million eggs. After spawning, black drum spread out within the Bay and will migrate southward in late fall. Juveniles, usually distinguished from adults by their 4-6 vertical bars, prefer shallow, nutrient-rich waters typical of tidal estuary habitat. Young-of-the-year black drum will remain in this environment until they reach approximately 2½ inches, when some will move to deeper Bay water. The recreational season for catching black drum is an intense four to six week fishery from late April to early June and is usually concentrated on and around the spawning grounds west of Cape Charles. The majority of black drum caught as part of the commercial or recreational fishery in the Bay are older, larger fish, with an average age in the Virginia fishery of over 20-years (CBP, 1994). Because age distribution of this species varies greatly along the East Coast, southern fisheries mainly target younger, smaller fish, while northern fisheries target older, and larger fish. For current recreational size and creel limits, see Maryland's updated regulation page. 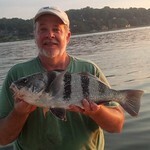 For information concerning black drum and their management, please contact Harry Rickabaugh.